April showers are bringing the May flowers! 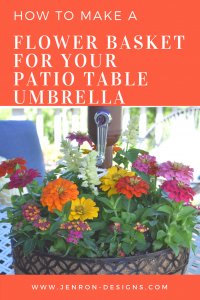 Today I am so excited to share my leastest creation, the DIY Flower Pot for around a umbrella. Those of you that have followed me for a while know that I spend a lot of time saying “if I can not find what I want, I will just make one instead”. Well here is another prime example, of not being able to find what I wanted and creating it instead. Ta dah, I present the Flower Pot that fits around your umbrella stand. Now I know that this product does actually exist, I looked it up online at several places and they ranged $40-$100 a piece. I picked up this little gem for only $11.00 in store for a single basket, you can order the set online: Better Homes and Gardens 18 in. Outdoor Lattice Coco Basket – Set of 2 at Walmart. Then $3.33 for 1 1/2″ diameter PVC pipe. 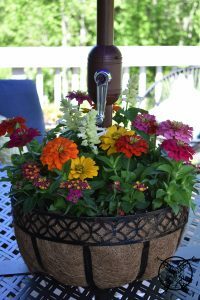 So, for under $15 (flowers not included) we were able to create this great planter for my summer centerpiece. *Please note that this post may contain affiliate links for your convenience. These involve no extra cost to you, but may result in me receiving a small commission – for which I am very grateful! You can view my full advertising disclosure here. So here is what we did. 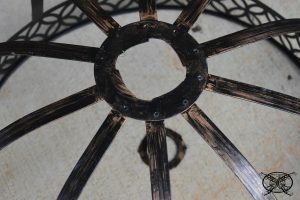 The base of the hanging basket already had perforated holes in the base. 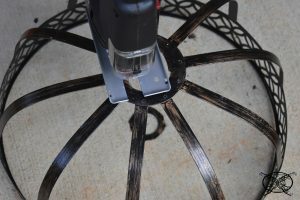 My husband used a jig saw with a metal cutting blade to cut out between the holes. This does not need to look perfect, since it is the bottom. 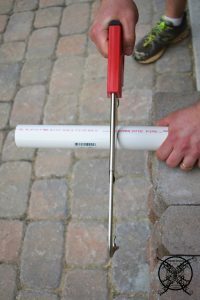 It just needs to have the 1 1/2″ diameter opening for the PVC pipe and Umbrella base to pass through. Next we measured the height of the PVC and marked it with a pencil. We did this since we do not want the pipe to stick out past the top of the basket. My husband then but off the PVC pipe with a hack saw to the desired length. 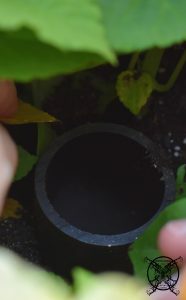 Once it is dry you place the PVC pipe into basket making sure that it pushes through the mesh liner. I recommend lightly scoring the mesh with a X to make this part easy. 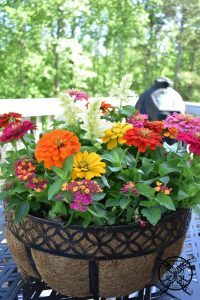 Once in place, fill up the flower basket with dirt and plant your flowers. Hopefully, once the flowers are in place you will not see the PVC pipe at all. I would recommend using taller flower towards the middle and lower ones to the outer edges to create a mounded effect. 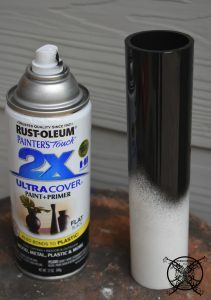 This will help to cover the PVC pipe too. I have used Salvia Vista White, a taller plant, towards the middle. 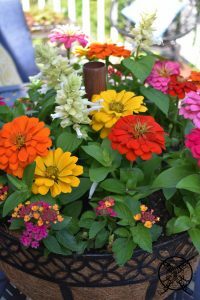 Followed by a ring of Magellan Mix Zinnias. Along the outer edges I tucked in some Camara Carlos Lantana, which grow outward and create some dripping effects. 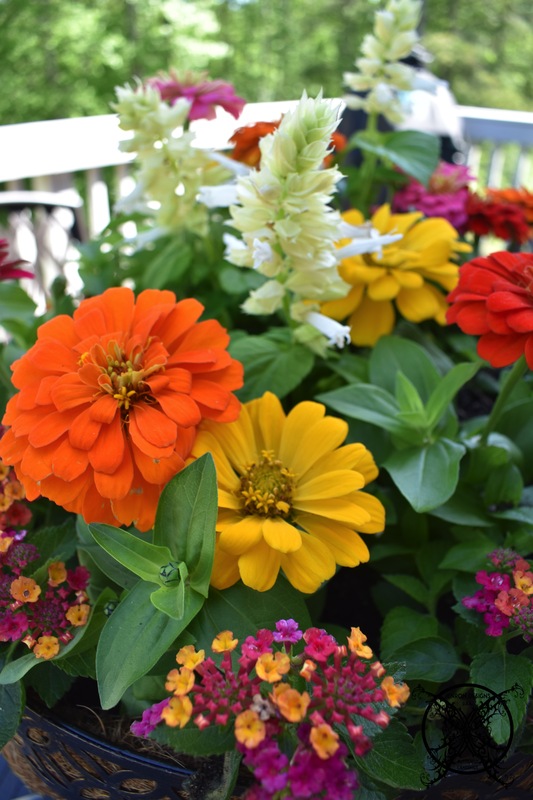 I was able to pick all these beauties up at Abbotts Creek Nursery, one of my favorite places to go pick up annuals in the local area. 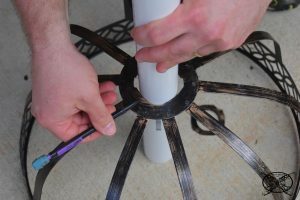 We then placed the bottom of our umbrella pole into the center on the flower basket all the way through to the umbrella stand at the base. 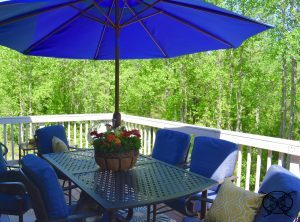 This will be able to stay here throughout the summer too, for easy attachment of the umbrella top, or it can be removed, if you do not like the way it sticks out of the arrangement. This will allow us to just snap on our umbrella top when needed on those extra sunny days. We can still access the crank mechanism to raise and lower the umbrella too. Since the arrangement does not take up the entire table and is contained to the center, you have plenty of space for your table settings and even a few larger food trays. This is the perfect DIY for my new patio set, love this idea so much! Thanks for the great inspiration friend. I was looking for this post since I wanted to add a few mums to our back patio furniture we just picked up at the end of season. Great idea and it works perfectly. I really like this idea I need to pin this for next year! Hеy there, You have done a great job on this DIY. I definitely digg it and I will personally recommend to my friends and followers. I’m confident they’ll bе benefited from thiѕ sіte. Nice site. This would even be pretty for outdoor wedding tables around a bar area. Great idea. 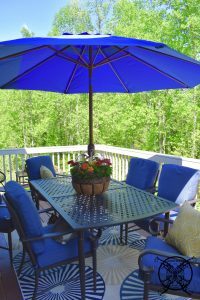 Very interesting idea for a patio table with umbrella. I think we are getting one at the end of season this year so I need to pin this idea for next summer. Hey, I think your site amazing! 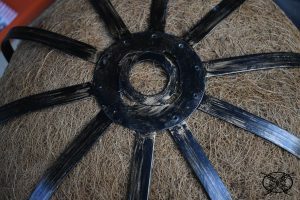 Great ideas and always easy to follow DIY’s,just a superb blog! This is a great DIY. I should give it a try and spruce up my yard. Very cute idea. I love the view off of your deck. This is a really cute idea. 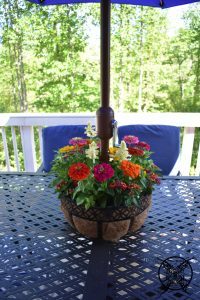 It adds a great boost of color to your patio table. It’s really cool how it goes around the umbrella as well. Great Job! I love ideas like this! Budget-friendly and beautiful. Thanks for the DIY! What a perfect project. I’m going to have to give it a try! What a beautiful, creative design! You definitely make me want to revisit my diy arts and crafts side. This is an awesome idea and it looks fantastic. This is so adorable, such a fun project to try. 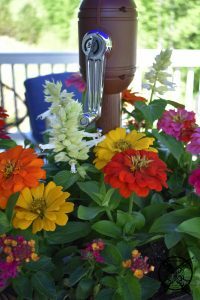 What a great idea Jennifer, the flowers are beautiful and I can see how the extra weight around the umbrella stand would be useful. We tend to get some strong winds here so this will be useful! I absolutely LOVE this idea! I have dubbed myself a crazy plant lady, and spend a lot of time on my back porch. This would make our back porch even more beautiful! Thank you so much for the idea! Definitely pinning for later. This is very beautiful, ideal and it looks so pretty. Great idea. Jen this is a really great idea for the summer, and the perfect way to dress up those umbrellas. Thank you for all your time and help! This is so cute! What a great idea to add for summer decor and to hide the pole base! Love it! Omg this is such a brilliant idea! My table needed something like this!! The price is even better!! So excited to try this! This looks so great and very doable! I love making my own things too instead of buying. Your flowers look really pretty. It’s a great idea.